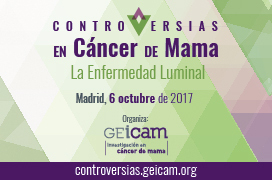 GEICAM was established in 1995 with a scientific nature and the aim to promote breast cancer research. Management and administration of the Group are carried out by the Board of Directors and The General Assembly. Full Members: Graduates or PhDs in Medicine and Medical Oncology specialists. Adhered Members: Graduates or PhDs in Medicine, currently studying 4th or 5th course in Medical oncology, medical Oncologists that live and work outside of Spain. Collaborators: Graduates in any scientific branch related to Health Sciences that, due to their knowledge, can help develop the Association’s goals. Affiliates: University graduates not related to Health Sciences. People that are interested in medical oncology and breast cancer, and willing to contribute to the goals of the Association. Honorary Associates:Full members that, because of their scientific character and dedication to the Association, have contributed prominently to the development and achievement of the goals of the Association. Participate in scientific activities and social acts promoted by the Association. Make proposals and petitions to the Government Board. Receive publications edited by the Association. Take part in the Board of Directors as provided by the statutes. Be informed, at least annually, of the state of the Association outcome and income, the composition of the Board of Directors, statement of accounts and development of activities. Full members will be able to participate with voice, but without voice, in the Government Branches. Full members will be able to participate with voice and vote in the Government Branches. Once their formative years are finished, Adhered Members may become Full Members. The new situation must be communicated to and approved by the Secretary beforehand. Participate in scientific activities and social acts promoted by the Association for all members. Make proposals and petitions to the Government Branches in the Association. Be informed, at least annually, of the state of the Association outcome and income, the composition of the Government Branches, statement of accounts and development of activities. Collaborate will be able to participate, but without voice and vote, in the Board of Directors. Participate as assistants in general Assemblies, without voice and vote. Honorary Associates will be able to participate with voice and vote in General Assemblies. Following the present statutes and agreements adopted by the General Assembly and the Executive Board. Paying the entrance and periodic fees agreed by the Executive Board. Notifying the Secretary of the Association in writing any change in their data. Associate members can be sanctioned by the Director Board in case of repeated infringement of its statutes or the government and administration’s agreements. To receive updated scientific information in oncology and other specialities related to breast cancer. To be eligible for the Ana Balil and Amadeu Pelegrí grants. Price reductions for courses and congresses. To freely receive the group’s publications. 28703 San Sebastián de los Reyes (Madrid). CLICK HERE to download the membership request form.